1022AM. This is the first photo received at thestraigthtsdotcom. 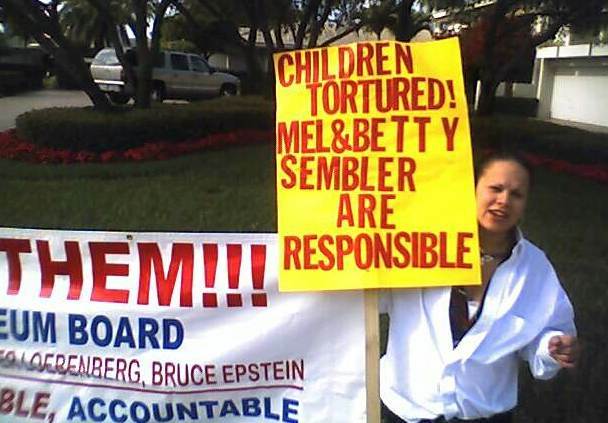 This was a joint protest of those seeking redress from Mel Sembler, et. al. for their involvement in the Straight program, and from the Uhurus, a political group seeking social justice for blacks. A man named Patrick Bush was the spokesperson for the mixed group. He appears to be neither a Straight survivor or a member of the Uhurus. An eye witness reported that the housekeeper came out of the house to get the newspaper and started freaking out at the sight of the mounting protesters. She shouted something at them. The Uhurus had a chant they would sometimes use. It brought out neighbors including people in condos across the boulevard. Cars slowed down to see what was happening. 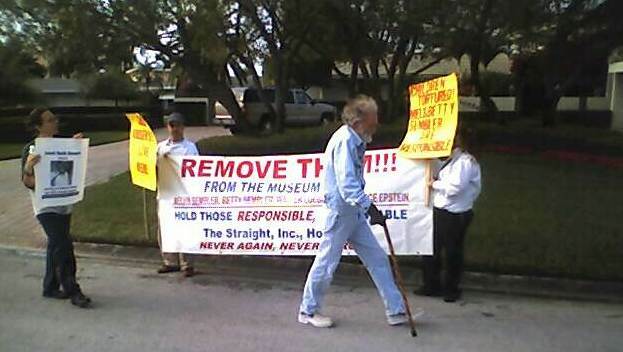 The police gave two protesters verbal warnings for passing out fliers which the police claimed could not be done. For an explanation of why there was a protest, go here. Two unidentified protesters holding a banner. Keith Stewart protested Bay Walk, the $40 million shopping center built and operated by Sembler Company, for alleged racism after some black gentlemen were removed from Bay Walk's Wet Willies Bar last fall. 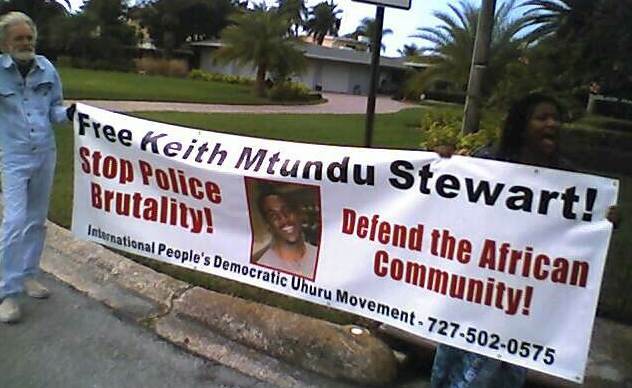 The Saint Petersburg Police Department, which has a long history of favorable ties to Melvin Sembler, has charged Mr. Stewart with "inciting a riot"--a felony.